Most of the time, your pet's body will keep their ears in healthy condition. However, if your pet is prone to ear infections or excessive ear wax, you can support its ear health by cleaning the ears using a special ear cleaner. Ear infections in cats and dogs are a very common problem. Dogs with "floppy ears", allergies or dogs that swim a lot are at a higher risk of developing ear problems. Animals with an ear infection will shake their heads, scratch their ears, whine as a result of pain and sometimes it will make them ill. Their ears are often dirty, red, swollen, warm and smell bad. In most cases, the skin in the ear canal is infected. From time to time our pets may have middle ear infections, which has a greater impact than a "regular" ear infection. The infection can be caused by various pathogens: bacteria, yeasts and fungi. This means that the infection can also manifest itself in different ways: redness, flakiness, yellow or brown ear wax, pus, blood and combinations of these. Most germs are sensitive to a medicinal ear ointment. It is very important that the eardrum is intact. Your veterinarian can look into the ear and advise you on the right treatment. Aside from (bacterial) ear infections, ear mites in dogs and cats can often be the cause of ear problems as well. These are small creatures (parasite) that live in and around the ear. These creatures feed on the ear wax and cause a lot of itching and discomfort in your pet. We usually see ear mites in young animals, but animals of all ages can be infested by these. The mites will die with treatment (this usually has to be repeated) with products such as Otimectin (for cats with intact ear drums) or Stronghold (available from your veterinarian). If you have more than one pet (dogs, cats or ferrets), we recommend that you treat all of your pets at the same time using a product suitable for their species. In addition, there are animals (usually dogs) that suffer from excess ear wax. This does not hurt your pet's ears, but can cause itching and usually emits a strong odour. 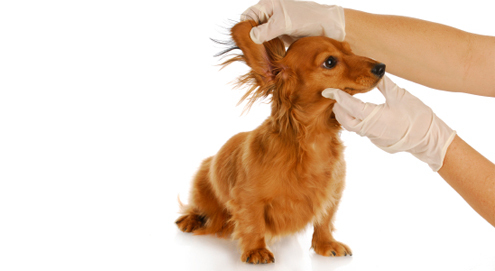 If your pet has excess ear wax, this can increase the risk of an ear infection. You can remove the excess ear wax yourself on a weekly or monthly basis using special ear cleaning products. Examples of these products include: Epi-Otic, Otoclean or Oto-Aid. Do not use cotton buds or other objects to clean your pet's ears. Of course there are many more causes for problems in and around the ears, ranging from an infected wound or a blade of grass in the ear to the formation of thickenings (polyps, tumours) in the ear canal. Itchy or painful ears that lead to scratching, head shaking and pain when you touch the ear can have a significant effect on your pet's wellbeing. When in doubt, please consult a veterinarian. If your cat or dog is prone to ear problems, it is important to try and prevent these problems where possible. The best way to do this is by cleaning the ears (and ear canals) regularly using an ear cleaning product. In terms of frequency, once every two weeks is a good starting point. If your dog is a keen swimmer, it is sensible to clean the ears immediately after the dog has had a swim. You can use products such as Monoclean, Epi-Otic, EpiSqualan or HexoClean. If your dog has no visible symptoms and you don't have any indirect indication of ear problems, then you do NOT need to use these products. Please note: never use cotton buds to clean your pet's ear canal! If there is light irritation or redness of the outer ear canal, you can use Dermiel ear drops. These have a soothing effect and promote your pet's recovery. In the event of these symptoms, you could also choose to treat your pet with Puur Auris. If the symptoms do not subside or if they get worse, we would advise you to consult your veterinarian. Sometimes ear problems (especially in dogs) can be caused by food hypersensitivity. For these specific cases, a special food has been developed: Royal Canin Hypoallergenic. If you decide to give your pet this food, then it is very important that you only give your dog this food for 6-8 weeks (this includes not giving your dog treats, etc.). Only then can you assess the effect of this food on the ear problems. This food is composed in such a way that it can be given to the dog for life, if it has a positive effect. Do you have any further questions about caring for your cat or dog's ears? Please contact our veterinarian by phone on 020 3191 8322, or via e-mail at: veterinarian@vetsend.co.uk. Antibacterial & antifungal ear rinse. For smelly ears in dogs & cats. Safe & mild ear cleanser for dogs & cats. Removes & softens excess ear wax.